Overview: By now, I think we all know the Daredevil story. Blinded as a youth, Matt Murdock’s other senses have been heightened, allowing him to do spectacular feats beyond that of a normal man. Whether fighting crime on the streets at night or defending clients in court during the day, he is the Man Without Fear – Daredevil! This is Essential Daredevil Vol. 6. Now at this point with the collection, Daredevil has been in business for over 10 years. Maybe it’s time for a change, to shake things up for the characters. For starters, let’s get the law firm of Nelson & Murdock out of their fancy offices. Instead, we are going to have them open up a storefront legal clinic in the middle of Hell’s Kitchen, where anyone can walk in off the street to discuss their legal problems. Let’s also introduce a new girlfriend, Heather Glenn, for Matt. A free spirit that makes you question what color the sky is in her world. (Given that this is a black & white collection, the answer should be white, but you never quite know how she might answer that question.) But just when things are getting comfortable between Heather and Matt, who should return but former romantic interest and secretary Karen Page. Maybe we can add some new faces to the rogues’ gallery? In shoots Torpedo – but is he a hero or a villain. Or both?Then there is the new assassin known as Bullseye. He never misses regardless what the weapon is in his hands. But fans like the old foes too, so let’s bring in the likes of the Owl, Cobra, and Mr. Hyde. And being the in the Marvel Universe, you know you will have to cross paths with some other heroes, such as Iron Man, Black Panther, Namor, and Ghost Rider. But Daredevil still shines brightest when he is a hero for the common man. Stopping a runaway bus, finding a lost boy in the big city, dealing with crooked cops, and the other challenges that come up from time to time. Going toe-to-toe with the villain of the month may sell comics, but protecting his city defines the man. What makes this Essential? : I’ve got mixed opinions for this collection. Part of me says this is essential simply for the character introductions. Heather Glenn would be a long-time romantic interest for Matt. The Torpedo was a C-List hero but became a key part of the ROM book. District Attorney Blake Tower would become a fixture in many Marvel books, such as Amazing Spider-Man. 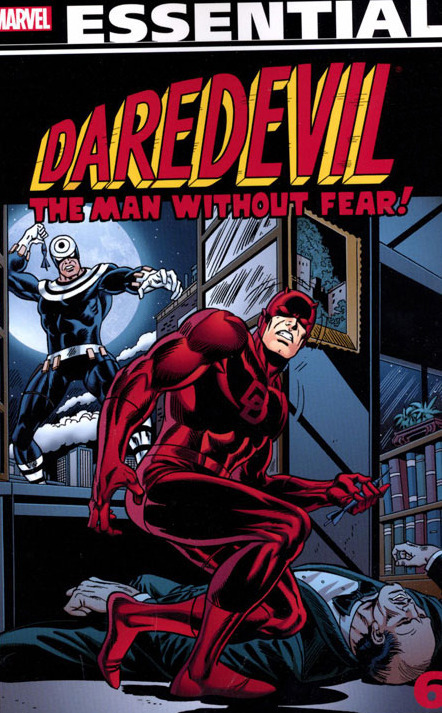 Bullseye would become one of the most important Daredevil villains of all time, especially given the events during the Frank Miller run. But…. these stories just seem very average. Marv Wolfman writes the majority of the stories in this collection, but I don’t feel like this is his best work. This was doing the era when Wolfman was also serving as Marvel’s Editor-in-Chief, so it makes sense that this title may not have had his full attention. I want this to be a stronger title, given the list of creators attached to these issues. Footnotes: Ghost Rider #19 & #20, and Daredevil #138 are also reprinted in Essential Ghost Rider Vol. 1. If you like this volume, try: Brian Michael Bendis’ legendary run on Daredevil in the early 2000s. I’ve previously recommended the Miller run, the Kevin Smith run, and the Mark Waid run with the Man Without Fear. It makes sense to cover the Bendis run, as he takes Matt Murdock and friends in a whole new direction. Bendis really makes this a psychological examination of what makes the hero, dragging him down to his lowest point ever. The Kingpin returns as the main protagonist for Daredevil, as well as the Owl and Bullseye. The highlight of the run is Matt Murdock being outed as Daredevil and forced to defend his name in court in a desperate attempt to maintain the dual identities. This series has been collected multiple times in trade paperbacks, hardcovers, and omnibus editions, so it should be easy to track down. Overview: Welcome back to the 30th Century! In the future, everyone speaks Interlac, which makes things easier when we are meeting new alien races every other issue. The United Planets is led by President Marte Allon, and security is provided by the Science Police. But for those larger than life threats that occur on a regular basis, there is the Legion of Super-Heroes, a group of teenage heroes with unique powers and abilities. This is an interesting transition era for our teenage heroes. Jim Shooter brings his legendary run to an end during this era, but not before introducing a few more core characters into the vast Legion universe. Mordru becomes one of the Legion’s main villains – a magician intent on conquering the universe. Chemical King finally joins the team in Adventure Comics #372. We were first introduced to him in Adventure Comics #354, where a memorial room to deceased Legionnaires foretold a death of a Legionnaire that did not even exist yet. finallyWho are the Legion’s most fearsome villains? Find out in this book with the debut of the Fatal Five, the Sun-Eaters, Universo, and the Dominators! We meet the above-mentioned President Allon, who also happens to be the mother of Gim Allon, who we know as Colossal Boy. That connection proves to be both helpful and hurtful for the Legion in the years to come. Timber Wolf officially joins the team after graduating the Legion Academy. The twin children of Barry Allen and Iris West make their first appearance not in the pages of The Flash, but in the 30th Century. And they seem to have inherited their father’s abilities. There is a lot of action going on here, either in full-length stories or eight-page backup features. Put your Flight Ring on and dive into the future. Why should these stories be Showcased? : I wish I was more behind this book. Don’t get me wrong, I love this book. I think Jim Shooter’s take on the characters is one of the most important runs on the Legion in their 50+ year history. My hesitation for this collection is how the Legion got relegated to backup status in the late 1960s. After a long run of being the lead or sole occupant of Adventure Comics, their run came to an end and the book was given over to Supergirl. After that, the Legion became an eight-page backup feature in Action Comics and Superboy. 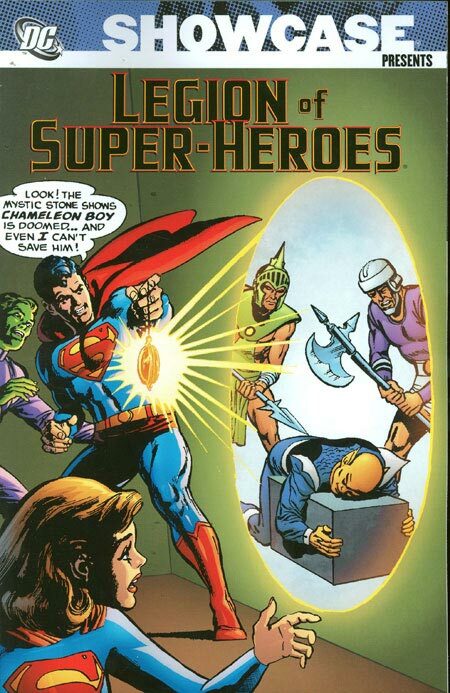 Now having read ahead, I know that the Legion ends up usurping Superboy’s book, as we will see in the next Showcase Presents volume. But the eight-page stories lead to smaller casts of characters per story, as well as limited character development during this time. If you are a Legion fan, get the book. If you are a casual fan, you may get frustrated by the last 200+ pages of the book. Buyer beware! Footnotes: Adventures Comics #403 is a giant-size reprint issue, collecting four classic Legion stories. In addition, there is a three-page feature of new costume designs for Legionnaires submitted by readers, and a two-page diagram of the Legion headquarters. Those two features and the cover are included in this collection. Class is in session at the Legion Academy beginning in Adventures Comics #372. If you like this volume, try: Legion of Super-Heroes animated series, which aired for two seasons on Saturday mornings from 2006 to 2008. Following parts of the storyline that we all know by now, the founding members of the Legion travel to the 21st century to recruit a young Superman* to travel with them to the future and learn how to become the greatest hero ever. The two seasons each contained 13 episodes, and many familiar stories and characters made appearances. Watching this can be a little bit of a challenge. Both seasons are available on DVD. Season 1 is available for Amazon Prime members to watch for free, but season 2 is only available to purchase by the individual episodes. For those wanting to introduce the Legion to a younger generation, this may be the gateway to the future. * At the time this show was on the air, there was an ongoing legal dispute between DC and the Jerry Siegel estate over who owned the rights to the Superboy concept. To avoid any conflicts, Clark is always referenced as Superman. Overview: You would think that Tony Stark would have things easy by now. His company, Stark Industries, is doing well; Tony’s heart is getting stronger thanks to a pacemaker; his love interest Marianne Rodgers, really digs his thoughts; and his Iron Man armor has never been better. Life’s good, right? Um, not so much…. Tony Stark/Iron Man faces a variety of challenges – at home, in the corporate boardroom, and on the battlefield. Stark finds that with his heart healing, he can commit to a long-term relationship with Marianne, and proposes to her. However, Marianne has E.S.P. powers that constantly foretell of dangers that Iron Man will face. She can’t bear the thought of Tony dying, and stumbles down the path to insanity. Tony breaks off the engagement, as he finds that his role as Iron Man once again gets in the way of living a normal life. At Stark Industries, Tony is facing a takeover battle by Simon Gilbert, the chairman of the board. Gilbert uses his sway to have Kevin O’Brien don the Guardsman armor, which corrupts his thinking. The Guardsman becomes a pawn for Gilbert to use against Stark. When the takeover bid fails, Gilbert takes matters into his own hands by planting a bomb in one of Stark’s construction plants. His hubris gets in the way, and Gilbert is killed in the explosion. While in the armor, Iron Man faces a variety of foes, some familiar and some new. No book would be complete without an appearance by the Mandarin. He sneaks into the picture as Gene Kahn (think about it! ), a labor organizer trying to create unions at Stark’s facilities. Firebrand returns and the revelation of his parentage explodes across the pages. And in the midst of everything, a new villain is introduced that would have far-reaching effects on the Marvel Universe as Iron Man is caught up in a fight between Drax the Destroyer and Thanos! What makes this Essential? : Issue #55 (first appearance of Thanos) is what makes this volume of stories Essential. However, the stories preceding and following this issue seem small in comparison. You could get this volume as a cheap way to read this issue. There are other reprint collections which feature issue #55, in color, for close to the same price. Pick up one of those volumes. Get this only if you are a die-hard Iron Man fan. Even that might be a waste of money, but not as much a waste as Iron Man installing roller skates in his boots — see issue #56. Footnotes: While Iron Man #55 is considered to be the first appearance of Thanos, he does not truly appear in this issue. The Thanos we see is a robot, and other appearances are in flashback. The first full appearance of Thanos is Captain Marvel #27. Iron Man #55 was also reprinted in Essential Captain Marvel Vol. #2. If you like this volume, try: the Thanos Rising story by Jason Aaron and Simone Bianchi. I realize that I am quickly making this review into Essential Thanos Vol. 1, but bear with me. Thanos has become a major player in the Marvel Universe, and now the Marvel Cinematic Universe. With the interest in the character, Aaron and Bianchi visit the origins of the demigod, explaining his childhood and how he came to power. Both creators are at their artistic peaks with this storyline, making the reader feel compassion for what is one of the most-evil villains in the Marvel library. Overview: Every hero has to have a weakness, right? Over at DC Comics, Superman must avoid Kryptonite, Green Lantern is useless against anything yellow, and Aquaman cannot be away from water for very long. At Marvel, Iron Man comes to mind, as Tony Stark has been living on borrowed time with his damaged heart. His armor has kept his heart beating for years. But for all of his money and genius, Stark has never been able to fully repair his heart – until NOW! 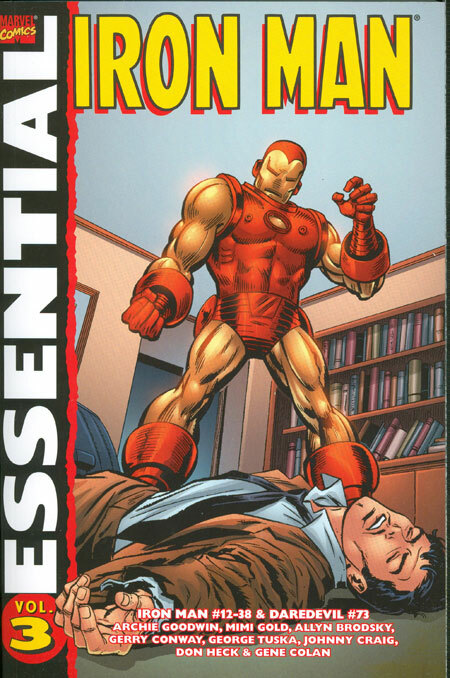 So let’s dive into Essential Iron Man Vol. 3. Tony Stark finally decides to scale back his Iron Man life and to live more outside of the armor. He has met the (current) love of his life, Janice Cord, and wants to spend as much of his time with her as possible. That means he is finally ready for that heart transplant, so he doesn’t have to be tied down to the armor so much. The transplant is a success, but circumstances always force Stark back into the armor. Shortly after his surgery, Iron Man has to face off against the Titanium Man and the new Crimson Dynamo. During that battle, Janice Cord is fatally injured, once again throwing Tony’s life into chaos. Some new faces come into Tony Stark’s life, some more important than others. Boxer Eddie March becomes the next man to wear the Iron Man armor. His run is short-lived, but he will return in later Essential volumes in a freaky appearance. Whitney Frost, whom we met in the last Essential, is injured and forced to hide her scars behind a face plate, becoming Madame Masque. The villain Firebrand shows up for the first time, but he will have a longer (and more important) story arc in the next collection. And Kevin O’Brien is hired on at Stark Industries; in the next collection, he will don a green version of Stark’s armor and will be called Guardsman. Perhaps the most significant addition would be Marianne Rodgers, who becomes the new romantic interest for Tony. While her first appearance is listed as Iron Man #36, some people believe that she is the “Marion” character from Tales of Suspense #40, who suggested that Iron Man paint his armor some other color besides battleship gray. When she appears in Iron Man #36, it’s implied in the story that they already know each other, Tony starts referring to her as “Honey” within three pages. What makes this Essential? : I liked this volume, but I am struggling to give this a strong endorsement. Archie Goodwin and George Tuska dominate the first half of this book, and those are good stories. Allyn Brodsky and Gerry Conway take over the writing duties, with art by Don Heck, and I can’t really complain about that. But I keep looking through the book and I can’t imagine wanting to read this again. If I was more of an Iron Man fan, I could envision wanting to get back into these issues. 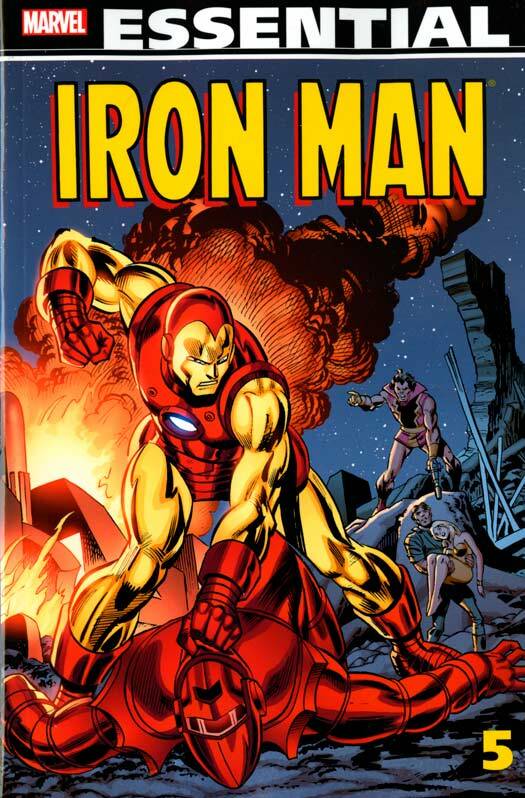 So what to do, what to do….. Definitely, read this if you are a fan of Iron Man. There are some key character introductions that will play important roles in the years to come. For the casual Marvel fan, maybe just flip through this on the side. Footnotes: Iron Man #35 & #36 and Daredevil #73 are also collected in Essential Daredevil Vol. 3. 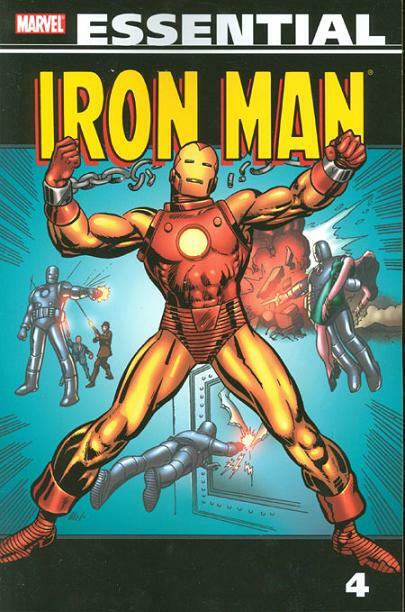 If you like this volume, try: reading Iron Man: Demon in a Bottle story by David Michelinie, Bob Layton, and John Romita, Jr. Collecting Iron Man #120 to #128 from 1979, Iron Man is besieged by numerous foes, with someone attempting to take over his armor. As the pressures increase, Tony Stark turns to alcohol. Unfortunately, Stark’s compulsive personality leads him further and further down a dark path. He is forced to turn over his armor to the police, and he must step down as leader of the Avengers. Stark finally bottoms out and recognizes his problem. With the help of Bethany Cabe, Tony goes through a withdrawal and begins the long, slow climb to sobriety. At the time this was created, this wasn’t necessarily written as a long storyline; they were just attempting to tell a good story month after month. It was only after the fact that people began to refer to this story arc as “Demon in the Bottle” (which was the issue name for the final issue in Iron Man #128) In 1984, this was one of the first stories that Marvel ever collected in a trade paperback. It has been reprinted multiple times in multiple formats, and should be easy to find. Overview: In preparation for this review, I consider some alternatives to make my point here. My first thought would be to increase the font size to a larger style, but I hate that when other sites do it. I CONSIDERED WRITING THIS ENTIRE REVIEW IN ALL CAPS, BUT I DON’T WANT TO COME ACROSS THAT I AM YELLING AT YOU, MY LOYAL READERS. Maybe I should attach a sound file with trumpets blaring, or I figure out a way to roll out a red carpet. See, the reason for these possible changes is to help convey just how EPIC is this collection of the Essential Avengers! Writer Steve Englehart and friends put together a series of memorable runs over multiple issues. This really felt like a heavy hitters lineup for the team, led by Thor, Iron Man, and the Vision. In this collection, the Avengers have their first encounter with Thanos; in a crossover with the Fantastic Four, we see Quicksilver and Crystal tie the knot in a ceremony delayed by Ultron; and we discover the secret origin of the Vision, in a story that goes back to the very first issue of Marvel Comics in 1939. The volume concludes as some new faces become probationary members of the team in Avengers #137. Having graduated from the X-Men and moved on to a solo career, the blue-haired Beast shows up for a series of adventures, but it won’t be until the next Essential before he earns his Avengers identification card. Also, Moondragon joins the team, making for a good consolation prize for losing out on the Celestial Madonna sweepstakes. What makes this Essential? 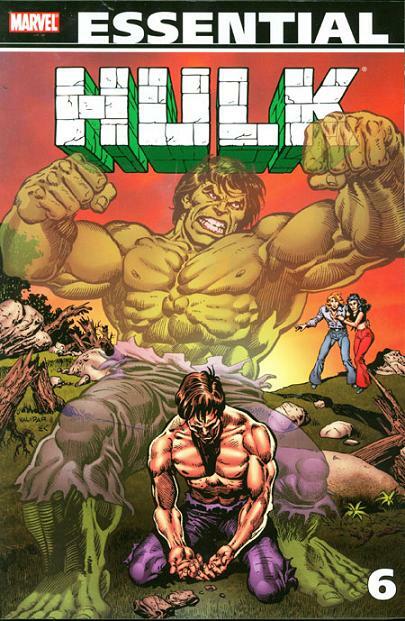 : This volume can best be summed up with one name – Steve Englehart. 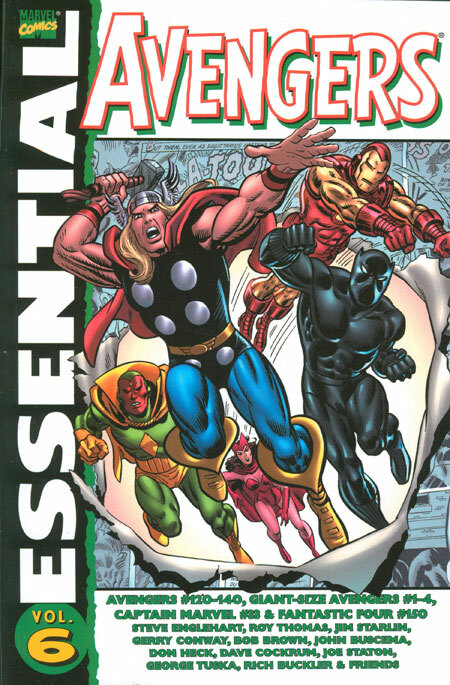 The writer had taken over writing duties on the Avengers in the previous Essential volume, and this collection sees Englehart work in all of the stories that he was really wanting to tell. He uses a core line-up of Iron Man, Thor, Vision, Scarlet Witch, and Mantis. (It should be noted that long-time Avenger Captain America was knee-deep in his own book at that time, and could only make the occasional appearance in the Avengers. By the way, Captain America and Falcon was being written by Englehart.) Mantis, a creation of Englehart and Don Heck, becomes the focus of the Celestial Madonna story in this volume. Towards the end of the run, Hank McCoy (a.k.a the Beast of the X-Men) Joins up, but this is the blue-furred Beast. Hank McCoy had undergone a further mutation in the pages of Amazing Adventures, written by — wait for it! — yes that’s right, it was Steve Englehart. So long story short, you need to be a big fan of Englehart and his epic vision for the Avengers to really appreciate this volume. I first read these stories out of order, as I picked up the back issues to fill out my Avengers collection over the years. Being able to re-read this story in order via the Essential allows me to better appreciate what Englehart did here. Footnotes: Captain Marvel #33 is also reprinted in Essential Captain Marvel Vol. 2. Avengers #127 and Fantastic Four #150 are also reprinted in Essential Fantastic Four Vol. 7. If you like this volume, try: the first series of The Ultimates. Hot on the heels of the successful Ultimate Spider-Man and Ultimate X-Men, Marvel turned to Mark Millar and Bryan Hitch to develop an Ultimate version of the Avengers. Trimming the team down to it’s 1963 roster of Iron Man, Thor, Hulk, Giant Man, the Wasp, and Captain America, Millar and Hitch created an EPIC spin on the historic narrative. Yes, changes were made to make the group more contemporary – most notable is Nick Fury portrayed as an African-American that happens to look a lot like Samuel L. Jackson, long before that actor was cast in any Marvel Studios role. Conversely, The Ultimates became a template that Marvel Studios could use as they began to shape the Phase One series of movies. This initial series ran for 13 issues, albeit over two years time, and has been collected in numerous trades and hardcover collections. There have been various sequels to spin out of this, but the original story remains the best by far.